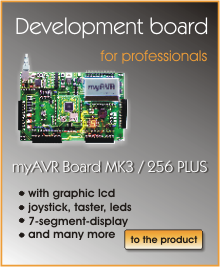 With the myAVR Stamp, microcontroller solutions can be developed and tested in the MK3 environment. 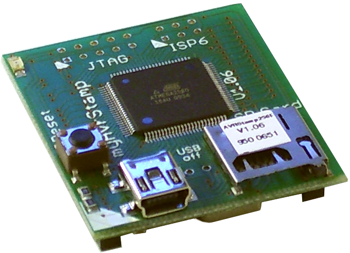 The myAVR Stamp is designed as a plug-in daughter board and can therefore be installed into a desired target system as a finished embedded controller after a successful test. 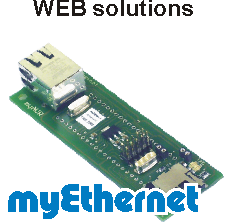 It has a JTAG, ISP and Mini USB port for communication and programming. With the Micro SD card holder, additional applications are available. no annoying SMD soldering is necessary! The installed bootloader makes a firmware update possible via the USB connection => no programmer is necessary! You can use the microSD card as bulk memory or for data communication with other systems (e.g. the PC). With it you can manage and work with websites, graphics, pictures, texts and many more. Underneath of the myAVR Stamp256 PLUS there are 2 female connectors to install the stamp in other systems. Through the plug connection (female connector and multi-pin connector) you can install the stamp anywhere in other systems. The multi-pin connectors which are suitable for the stamp are not in the scope of supply. You can also buy them here separately. There is not a microSD-card in the scope of supply. You can buy it here. 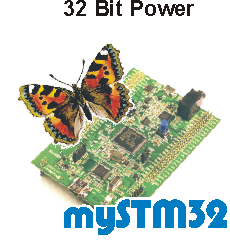 To take off the myAVR Stamp256 PLUS from a board we recommend the Stamp-Lifter. This make the take off easier without making damages on the board. For programming use only the ISP-cable 6-pole.